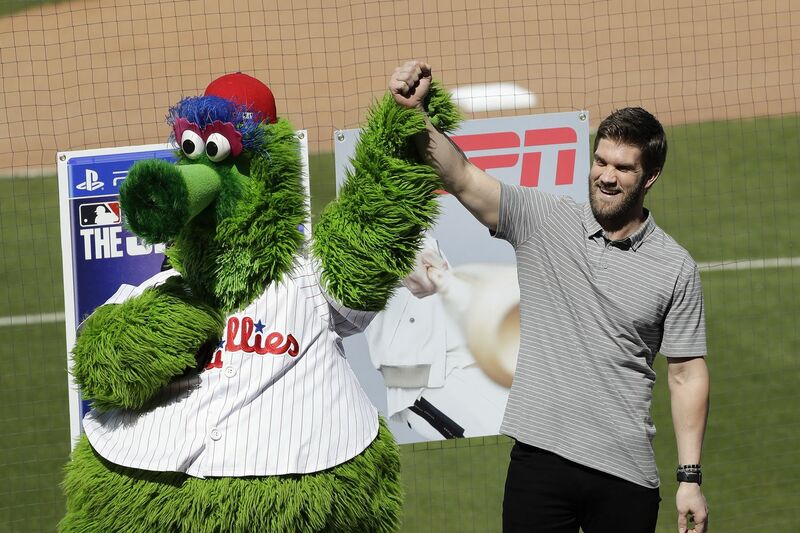 Bryce Harper was joined by the Phillie Phanatic. If you were up late on Twitter Friday night, you might have seen something very interesting cross your screen a little past 11 p.m. It was finally official -- the Phillies signed Bryce Harper. Even manager Gabe Kapler, who had to answer questions about Harper by hedging his responses with “if the reports are true,” chimed in on social media. And by the time the sun rose in Clearwater, Fla., the Phillies’ spring-training complex was ready to welcome the team’s new superstar. With the ball club down the road in Port Charlotte for a spring-training game against the Tampa Bay Rays, the Phillies opted for an outdoor press conference, complete with images from Harper’s first appearance on the cover of Sports Illustrated in 2009 at age 16, to the cover of the MLB the Show video game set to be released this month, all set up on the top of the first-base dugout. Even the Phanatic was down in Florida to see all the excitement. Harper took the “stage” with team owner John Middleton, general manager Matt Klentak and Scott Boras, Harper’s agent. Harper spoke at length about the importance of the family-oriented feel he got from meeting with Middleton and Middleton’s wife, Leigh. He emphasized how he and his wife, Kayla, were trying to find a place where they could build a family and get involved with the community. Klentak thought they made a great choice. “Bryce, Kayla, you’re joining the most family-oriented team in baseball," Klentak said. Harper said the weeks-long process “has definitely been a long one, but it’s been a fun one as well” after he thanked his parents and his wife. He noted that the circus surrounding his free agency was something to embrace. The 26-year-old outfielder ended up picking the Phillies, he said, because of the role family plays in his life and the desire to join a new family at this next stage in his career. Harper said he’s grown to love playing in Philadelphia and at Citizens Bank Park, and that he "can’t wait to get on that field and do Phillie nation proud. Bryce Harper checks out his new jersey with Matt Klentak watching. Harper said he was impressed by the way the Middletons and the rest of the Phillies’ front office treat the people in the organization, and found it “pretty amazing” that many people who work with the team work there for a long time. He said he heard it from the people in the elevators when he visited with the Nationals, and mentioned the security guard stationed on the visitor’s side of the ballpark who would always talk about how great it was. “Every time I went to Citizens Bank Park, I felt that," Harper said. Harper was also impressed by the passion of the fans, and said he was looking forward to having them cheer for him instead of against him. “My first six years, playing in Philly, the people behind me weren’t very nice,” he said to laughs. "But I like that. But the last year, they were nice, telling me, ‘Come to Philly.’ "
“My first thought was, if I sign with the Phillies, I don’t have to face Aaron Nola anymore,” he joked. He said his favorite player in the game is J.T. Realmuto, the catcher the Phillies traded for earlier this year from the Marlins. Realmuto, combined with Harper, Nola and Rhys Hoskins, who Harper met at the All-Star game, would make a potent combination in the playoffs. What did Harper think about their chances? “I’m not going to tell you we’re going to come in this year and win a World Series or win the division, but that’s the goal,” he said. " ... Good things take time as well, we got to mold as a team." Harper endeared himself to fans immediately when he explained his decision to wear No. 3. He acknowledged what the late ace brought to the Phillies organization and explained that he didn’t even consider asking Maikel Franco about No. 7, saying he didn’t even want to know if it meant something to him. The one issue with No. 3? His wife, Kayla, prefers even numbers. In the end, Middleton spent some money to get the player who has already invigorated a fan base at the ticket office. Was it a worthy investment? Middleton had no questions about it. And Harper clearly has his eye on the future, even making an obvious reference to Philly sports fan and Angels star Mike Trout when he was asked about the size of his contract. Bryce Harper on his money: “I’m making like $26 million a year, so that leaves some money there to sign other guys. There’s a guy that comes off the books in 2 years” AND OMG HE’S FISHING FOR TROUT. But what, in the end, does Harper want to do in Philadelphia? The same thing Phillies fans want to see.